Are the vogart paints exactly the same as hobbytex paints? and if so, why is the name different? Do you need to heat set the ink once you've finished the artwork? Hi there, thanks for your question. As Hobbytex paint is spirit-based paint, it is very fast drying and permanent. You don't need to heat set the fabric paint but you should leave it for at least 72 hours after painting, before washing if needed. Then you can iron the reverse side if you wish. Regards Jenny. Is it safe to use Hobbytex on neoprene? I want to label a wetsuit an am not sure if the solvent in the Hobbytex paint will be Ok.
Are these paints suitable for fabrics - can one mix them to make different colours? Yes they are designed for use on fabrics. They also go on most other surfaces like wood, plastic, glass etc. 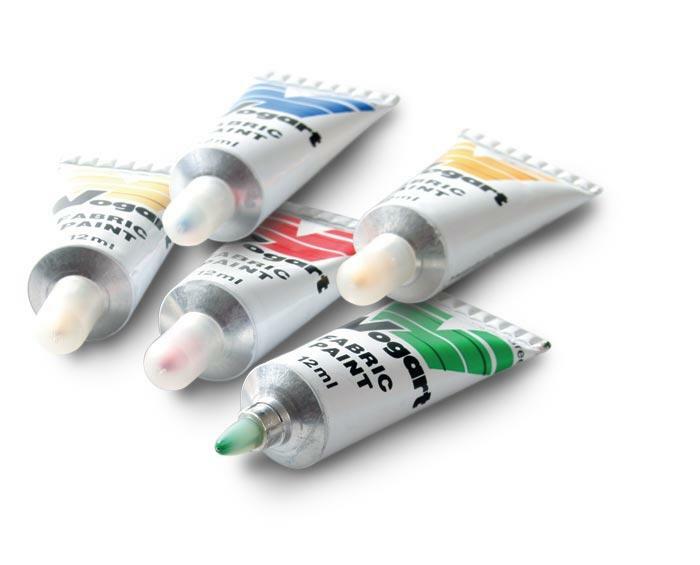 These half-sized tubes are the same paint as the larger tubes and also come with a ball-point tip. You can use the paint directly from the tip and blend colours as you apply them or alternatively unscrew the tip and squeeze out some paint and mix the colours on a palette. The paint is a spirit-based paint so dilute as required with the TipCleaner/Thinners not water.